Guiding sheath supplied sterile. For single use only. Available bulk upon request. Standard lengths are noted above. Other lengths and curves available upon request. 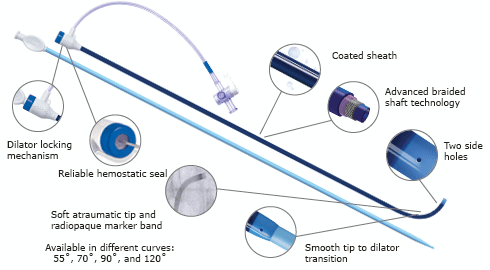 Adelante® Breezeway® T Guiding Sheath with Hemostatic Valve. The Adelante® Breezeway® guiding sheath is intended for the percutaneous introduction of various types of cardiovascular catheters to all chambers of the heart, including transseptal puncture. The Adelante® Breezeway® features a proprietary braided Flexsteer™ hydrophobic coated sheath and the latest SureSeal™ technology.